The juvenile salmon behind the curved glass of the newest aquarium installation at the Sitka Sound Science Center are a pretty dour crowd. Their grey lips curl down in fishy frowns, or pucker around their next microscopic meal. But one doesn’t need to look far to find a smiling face in this fish tank. 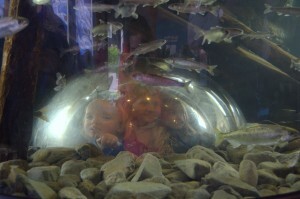 A large bubble of glass is built into the bottom of the salmon’s tank, allowing visitors to crawl under the aquarium and look up into the tank, smiling widely as they view the world from a salmon’s underwater perspective. This interactive aquarium is part of a larger exhibit called “The Salmon Connection” that opened last week at the Science Center. The new display includes the salmon tank, educational artwork by Ketchikan artist Ray Troll, and a Salmon Olympics competition. The exhibit is the result of a partnership between the Science Center and the University of Washington School of Aquatic and Fisheries Science. It was funded by a grant from the National Science Foundation that supports projects and organizations who communicate research to a public audience. The display highlights the work of UW researchers currently studying how a range of habitat variety in salmon streams can lead to healthier, stronger salmon populations, which in turn lead to healthier coastal communities. Science Center Director Lisa Busch says that the goal of the new display is to draw an ecological and educational connection between the Center’s traditional exhibits focused on intertidal and marine environments, and its work running the Sheldon Jackson Salmon Hatchery. The exhibit will also include a video, under production, and a new game designed by Ray Troll that will be unveiled at Sitka’s Whalefest celebration in the fall. At the gala opening of the Salmon Connections exhibit, the aquarium’s main room was crowded with visitors. 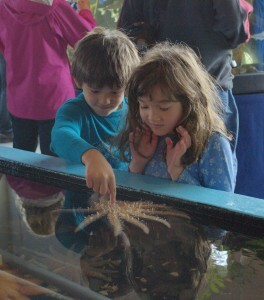 Adults and toddlers alike slurped rootbeer floats and poked at the huge colorful starfish in the touch tanks. Locals and tourists mingled, examining the cleverly drawn interpretative signs and Ray Troll’s beautiful painted mural on the back wall. 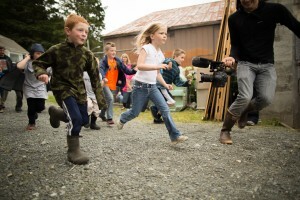 Outside, competition was fierce as several dozen kids raced to perform “egg-takes,” netting “female” water balloons out of holding bins, then transporting their slippery load across the yard to slice the balloons open and collect the precious “eggs” (pinto beans) that lay within. At the end of a frantic, wet 15 minutes, there didn’t seem to be a clear winner, but everyone was having a great time. Amidst all the bustle, I was drawn back inside to stand in front of Ray Troll’s mural, which depicts the huge variety of rainforest flora, fauna, and fishermen that rely on Southeast Alaska’s salmon runs. 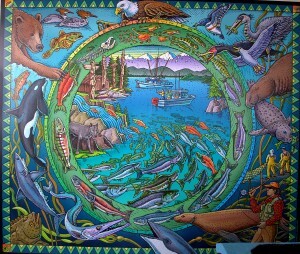 An illustrated salmon lifecycle chart frames the entire piece, encompassing the bears and gulls, trees and fisherfolk in a perpetual circle of death and renewal. The title arches across the top: “A Wild, Salmon-Centric World.” It seems a fitting label for both the mural, and the Science Center itself.